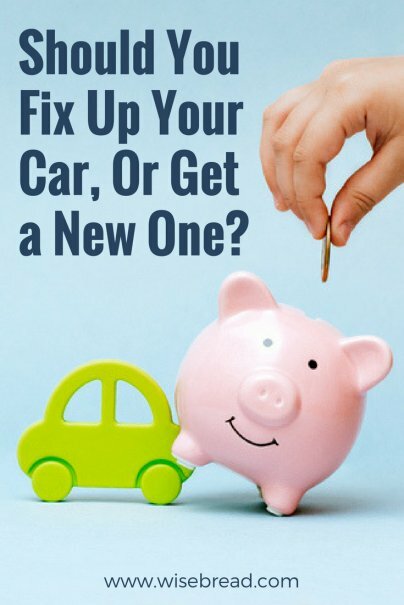 Home » Personal Finance » Cars and Transportation » Should You Fix Up Your Car, Or Get a New One? Your aging car's engine has been knocking loud enough that turning up the radio doesn't help anymore. You take it to your trusted mechanic, who gives you the bad news: One of your main bearings has worn out, and the repair will cost around $3,000. Since you can't know for sure if this is just the beginning of your car's transition into a rolling money pit, or if the $3,000 repair will get you motoring happily along for another 50,000 miles, it can be nigh-impossible to figure out whether to stick it out with Old Faithful or cut your losses and buy a new car. Thankfully, there are some guideposts that will help you to make this difficult decision. Here's what you need to consider if you are trying to decide whether to fix up your old car or get a new one. According to automotive journalist Steven Lang, there is one type of car problem that indicates your automobile is ready for that big garage in the sky: "If the integrity of the car's frame has been compromised by rust, then you should plan on getting a new car." Even if you are not concerned about the safety of continuing to drive your aging car, you might still worry that a repair is just the tip of the iceberg, and that you'll continue throwing good money after bad if you head down this path. Once you've found a forum, you can ask about the specific repair you are considering. It's likely that someone else has faced a similar problem on the same car, and they can let you know just how much more drive time their repair was able to buy them. So how do you know if the cost of a repair is worth it to you? For insurers, simple subtraction makes the decision easy. If the cost of a repair is higher than the Kelley Blue Book value of a car, the insurer will total the car. And if you are in a position to purchase a new car, this kind of simplified equation is helpful. However, what a car is worth to you is not necessarily as simple as that. If you own your current car free-and-clear, and would struggle to take on a car payment, the determination of whether the cost of the repair is worth it becomes a little more difficult. A good rule of thumb in this situation is to buy a new car if the repair would cost more than one year's worth of car payments — but keep the clunker if it is less. You can never know for sure if you made the right call with this kind of repair-or-replace decision. But gathering all the information you can about your car's safety, its common problems, and its worth can help you to determine if a repair will serve you better than a new car.